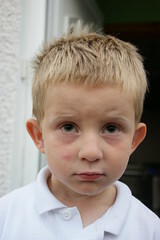 After three years of fighting the spots (as you can see we still have one of those on his right cheek) we received a letter from nursery saying he'd had an ambiguous eye test. That was about ten months ago. I rang the number on the letter from the NHS and was told he'd be recalled for a more detailed eye test within nine months. So off we trundled last week to Specsavers and they checked the health of his eyes - no problem, and rebooked us a week later for a pupil dilation and eye check. We arrived today, had his pupils dilated and were sent away for a half hour wait before the test could take place. To cheer him up I offered to take him to Waitrose for sweets. He chose a Kinder egg. I built the toy as he chomped on the chocolate. I handed it to him, only to have him ask what it was (a Little Red Riding Hood wolf in a nightie) - I hadn't realized the dilation would make his eyes so blurred he couldn't tell what he'd got, poor wee man! Once inside the optician diagnosed long-sightedness that he should outgrow before adulthood but insisted he wears glasses before his vision sustains any permanent damage in the meantime. Poor baby :-( He has such beautiful eyes, I don't want to hide them. Specsavers now want Marcel, Charlotte and Anna tested too - though Anna will need to be done during Léon's hospital appointment as she's too young for them to cope with. Marcel is less than amused at losing his Saturday afternoon to that, to say the least, and Charlotte is very (un)helpfully saying in front of Pudgeman that she won't be seen dead in ugly glasses! Thanks, Lots! At least Pudge himself is thrilled he's getting cool Mr Tickle specs - until he tries them on anyway. Are they sure he needs to wear them all the time ,, or is it just for reading or what ? Or maybe just to sell another customer their specs ? Maybe a 2nd. opinion at another optician since his eyes are "healthy"? Is it really enough that a high street optician (optiker) says that a child should have glasses? In Denmark you can't sell glasses to kids (under 10) without a prescription from a optometrist (øjenlæge). Perhaps it's because I have misinterpreted the terms? But poor Pudge - and poor the rest of them! Walking around with dilated eyes are NOT fun! Everything is just a big blurr of different colors. I used to bring Kåre, to tell me where to go! I sure hope he'll grow out of it very soon, and that everybody elses eyes are perfect. Yes dad he's to wear them all the time - if he doesn't his eyes will weaken by constantly fighting to focus on what he can't see and it could cause damage. This was the second opinion - he'd had an eye test by a optometrist at nursery. But yes they'll give him a third hospital test next month and will follow up at hospital until his vision problem corrects itself. High street opticians are optometrists Trine but yes - he'll be referred to hospital where someone who usually deals with children will work on him in future. Here high street opticians can deal with anyone over 4 because they have the equipment and qualifications necessary. Under 4s are always dealt with in hospital. Poor wee man still has huge pupils but has gone off to school bravely. I hope he'll be back to normal later today.